Bringing together the commercial power of the Ambassador Theatre Group and the theatrical invention of director Dominic Hill, The Choir is an attempt to develop a musical that is contemporary and popular. Ricky Ross, of Scottish pop outfit Deacon Blue, was enlisted to add a modern edge to this predictable story of how a community choir brings together a motley bunch who find redemption in song. Unfortunately, Ross’ music is predictable, referencing a variety of genres from cod-gospel through indie rock to plain chant without capturing much excitement. Most of the numbers are repeated several times, which only serves to emphasise the derivative melodies and, for one number, its similarities to David Brent’s Free Love on The Free Love Highway from The Office. Although the cast’s excellent harmonies rescue several of the numbers, the score is underwhelming and the obligatory rap routine reveals a poor appreciation of hip-hop’s dynamic rhythmic flow. The second act, which features long passages without musical numbers, does pick up the dramatic pace, as various characters explore their relationships. It’s here that Dominic Hill’s ability as a director is most evident. The cast give life to what had appeared, in the first act, to be a series of caricatures (middle-class snobs, working-class failures, a token gay man and young urban under-achievers caught in a loveless relationship). While the dramatic resolution is rather forced, Peter Polycarpou is outstanding as Khald, the choir-master with a tragedy in his past. 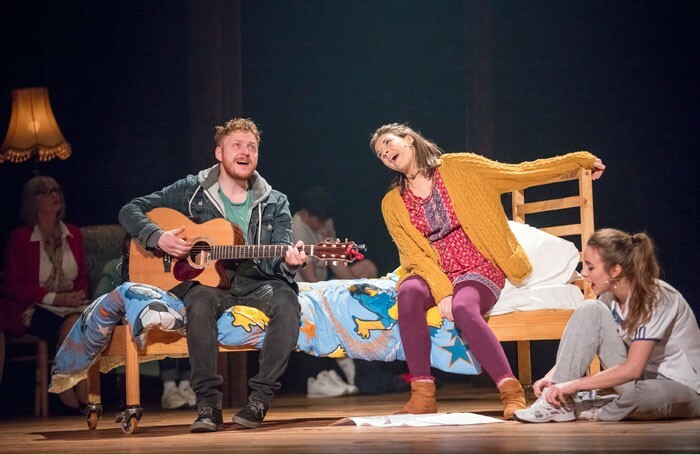 The scenes between Darren (Sandy Nelson) and Charlotte (Jess Murphy), the couple who don’t love each other, are fraught with anxiety, as Nelson and Murphy articulate their mutual frustrations, and the tentative seduction (through song) of Velia (Neshla Caplan) by Donny (Ryan Fletcher) is sensitively portrayed. Myra McFadyen brings life to an underwritten older woman (Eileen) and Scott Reid (Scott) makes the most of his caricatured lout. Yet, despite this remarkable cast, the musical only bursts into sporadic life. The repetition of musical numbers – which sound self-consciously designed to be catchy – and their limited choreography, drags the action out over an unnecessary length. Lurking beneath the songs, however, are a variety of intriguing themes: Donny is trying to re-integrate into society after a spell in prison; Velia and Bethany (Joanne Thomson) are holding onto a childhood friendship as their lives take them in different directions, and Khalid has a secret from his youth in Baghdad that prevents him from making any stand in a crisis. The potential of a community choir as a place for inter-generational conversation, and the building of genuine community of friends is made clear, and when this powerful message is aligned with the closing number – an inventive mash-up of several previous tunes – The Choir reveals an emotive and passionate energy.